Charlie first arrived on Sodor to help out on the railway. 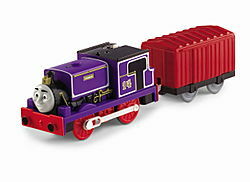 He was said to be the favorite engine of the Mainland Engines. When Thomas was to show him around, Charlie convinced him to have fun instead of bringing Alicia Botti to the concert.